WOW! Look at that piercing expression! I can't wait to see more! Keep checking back for the rest of the week until we see the cover as a whole! 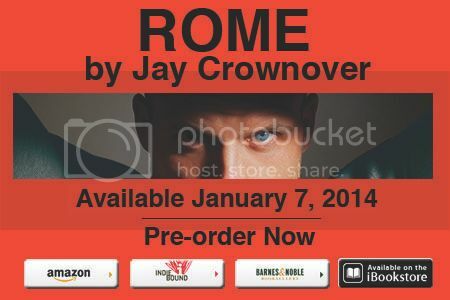 Rome is the third title in the Marked Men Series By: Jay Crownover will be released on January 7th, 2014 from William Marrow Books. 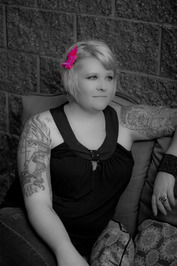 Synopsis: Cora Lewis is a whole lot of fun, and she knows how to keep her tattooed bad boy friends in line. But all that flash and sass hide the fact that she’s never gotten over the way her first love broke her heart. Now she has a plan to make sure that never happens again: She’s only going to fall in love with someone perfect. Rome Archer is as far from perfect as a man can be. He’s stubborn and rigid, he’s bossy and has come back from his final tour of duty fundamentally broken. Rome’s used to filling a role: big brother, doting son, super soldier; and now none of these fit anymore. Now he’s just a man trying to figure out what to do with the rest of his life while keeping the demons of war and loss at bay. He would have been glad to suffer it alone, until Cora comes sweeping into his life and becomes the only color on his bleak horizon. Perfect isn’t in the cards for these two, but imperfect might just last forever . . . I'm supposed to share interesting details about myself so that my readers get to know me so here we go in no particular order: I'm an natural redhead even though I haven't seen my real hair color in years, I'm a big fan of tattoos and have a half sleeve on either arm and various other pieces all over the place, I've been in the bar industry since I was in college and it has always offered interesting insight into how men and women interact with each other, I have 3 dogs that are all crazy, I live in Colorado and love the snow, I love music and in all reality wish I could be a rock star not a writer or a bartender but I have zero talent so there is that. I love to write, love to read and all I'm interested in is a good story with interesting characters that make the reader feel something. Comment and let me know your thoughts on this post. A Life Bound By Books by Lisa is licensed under a Creative Commons Attribution-NonCommercial-NoDerivs 3.0 Unported License. In accordance with FTC Guidelines, I have not received any monetary gain for any information posted within the pages of this website/blog. Any and all information has been provided by the publisher, author and or publicist for free. Content is also based on purchases made by myself or of my guest reviewer(s). Any and all opinions expressed within the pages of this website/blog are solely my own or those of the authors of any and all guest reviewers(s) or guest bloggers. Hi, I’m Lisa and I'm a proud bibliophile. I enjoy reading and reviewing a variety of different books within the Young Adult, "New Adult" & Adult genres/categories. If you have any questions or if you are an author or publisher and would be interested in promoting a book, please feel free email. You can find my email under the "mail" button or under the contact link at the top of the page. Reviews, Interviews, Guest Posts and Contest. Click for info & links to her reviews! When I review I rate from 1 to 5 stars, 5 being the highest rating. I review based on many different things from the writing, to the story - to the characters and how I can relate to them or how they are developed. I also review based on if an author has worked their magic and was able to draw me into a story so deeply that I don't want to put the book down. If you would like me to review a book, please contact me or view my Contact Information and Review Policy for further details. 5 Stars - I LOVE, LOVE, LOVE it! 4 Stars - I Really liked/Loved it. 3 Stars - I liked it/Was pretty good. 2 Stars - It was, eh okay. 1 Star - It just wasn't for me. Guest Post by Sarah Jones - Running in Horror Movies! Snark Week Double Down- Just STFU. I Just Wanna Sit Here And Read! DemonLover's Book Reviews & More!